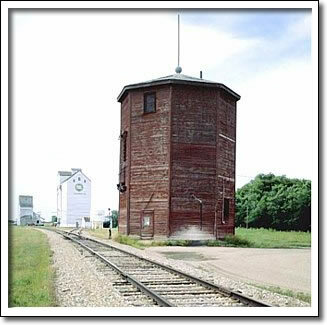 The railway water tower is a rare vestige from the age of the steam-powered locomotive. The "Standard Number One Plan," developed by the Canadian Pacific Railway (CPR) in 1903, replaced the low, round, towers in use since 1882. The new octagonal tower quickly became part of the Manitoba landscape, with 75 constructed from 1904–1925. The Clearwater tower is a fully operational "Standard Number One Plan." The slightly modified interior retains a cedar-lined tank with a capacity for 181,840 litres (40,000 gallons) of water. This formidable weight rests on a framework of large supporting timbers. A coal-burning boiler powered a water pump that prevented water from freezing. A ball or "float", glided along a pole atop the tower to indicate the level of the water inside. In 1957, when railway companies converted to diesel-power, water towers became obsolete. This tower still provides water for Clearwater and area residents.